A second stage triumph for Joan Barreda who commanded from start to finish in both specials of the Rally Dakar 2017 eighth stage. The Monster Energy Honda Team once again gave a master class in a race hampered by the weather. Stage eight of the Rally Dakar 2017, the second leg of the two-day marathon stage which set off yesterday from La Paz bound for Uyuni, was shortened by 72 kilometres due to a flooded river crossing in Bolivia. 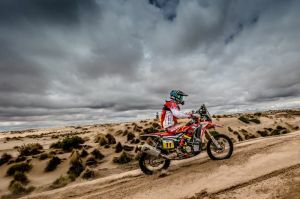 The day was split into two timed-sections, one covering 174 km on Bolivian soil, before crossing the border into Argentina for another, 246 km long. Joan Barreda went full-throttle right off the bat, determined to take the stage victory. The Spaniard clocked the fastest time of the 110 bike category entrees who left the bivouac from Uyuni this morning. The bikers were faced with innumerable hazards in the Bolivian mud. Once onto Argentine terrain the Monster Energy Honda Team rider really let loose, not letting up until the final flag where he sealed victory. The win marks the second triumph for Barreda and the third for the team after the Ricky Brabec’s win yesterday. On-form team-mate Michael Metge had another enjoyable romp behind the bars, posting fourth spot amid the chaos. In fact, as yet, none of the riders or assistance crew have been able to arrive at the bivouac in Salta. The entourage is held up some 200 km away from the destination after a landslide blocked the access route to the city. Monster Energy Honda Team’s Portuguese rider Paulo Gonçalves performed well in a bid to claw back lost time. Ricky Brabec had it tough today, having to open the track after yesterday’s win. The American was overtaken by Paulo Gonçalves and followed his team-mates trail to conclude the special without any serious loss of time. Tomorrow, the ninth stage, has finally been cancelled due to the poor meteorological conditions that affected all the Dakar logistics.